In 1974, he underscored his magnum opus as "Robert Moses and the Fall of New York." This week, Caro reiterated that New York has never recovered from the master builder's evil. Forty-five years after publishing The Power Broker, Robert Caro still blames Robert Moses for killing the city he loves. Asked at a New York Times “TimesTalks” on Tuesday night whether he has had second thoughts about the book’s subtitle — “Robert Moses and the Fall of New York” — given the city’s economic resurgence, Caro was unequivocal: Robert Moses was very bad for New York. Question: The subtitle of “The Power Broker” is “Robert Moses and the Fall of New York.” You published this book in the mid-1970s, in a particular time of misery and dysfunction. I was wondering how you feel about this subtitle in retrospect, given how, sort of, prosperous and almost gilded New York City is now. Caro’s response: Well, New York is prosperous, but New York is still … a very segregated city. When Robert Moses was doing his huge urban renewal projects, he was shipping people, the people he displaced to the Rockaways, because they were invisible there, and these bungalows have been used for that kind of housing for now, whatever it is, 55 or 60 years. Low-income housing projects, he would build only in low-income areas. And perhaps easiest for us to grasp right now, when Mayor O’Dwyer gave him complete power in the city over public works, I think, the year’s in my book, I think it’s 1949. There’s a chapter in there called “Point of No Return.” The state and the city were passing this huge bond issue, which was supposed to go primarily to renovate the subways, to maintain them — because maintenance had been stopped all during the war. Moses, through this series — I mean, watching it, in one place you’re horrified because you see the results, in the other, you say, boy this is smart — he manages to get all that money allocated for highways: the Brooklyn-Queens Expressway, the Verrazano Bridge, the second deck on the George Washington Bridge. None of it for the subways. We’re still paying for that. When you say, why has this maintenance been deferred for nearly three-quarters of a century, it really dates back to his genius in getting the money for his own projects. Of course, in 1974 when I wrote the book, the city was bankrupt and all, but the conditions that I describe — the suburban [slum] on Long Island. He starved the Long Island Rail Road, because he regarded it as a competitor for his Long Island Expressway and his tollbooths. All those things impact our lives every day, what he did. So I’m not unhappy with the subtitle. The full video is on YouTube — the exchange in question starts at 56:36. Where are there still bungalows in the Rockaways still used for housing people on welfare? A large area of bungalows near the ocean between B. 35 St. and B 80 St. were abandoned and demolished during the 1970s. I didn’t know that there were more of the same. Nice catch. This is the kind of content I miss on SB NYC. Robert Caro, Pulitzer-Prize winning author of The Power Broker: Robert Moses and the Fall of New York (Knopf, 1974) and the three-volume The Years of Lyndon Johnson, will offer reflections on the career of Robert Moses three decades after the publication of his seminal biography. Does New York Need a ‘New Moses’? 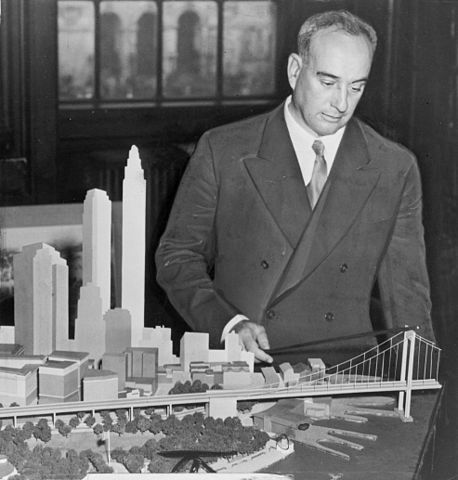 The New Jane Jacobs vs. the New Robert Moses?